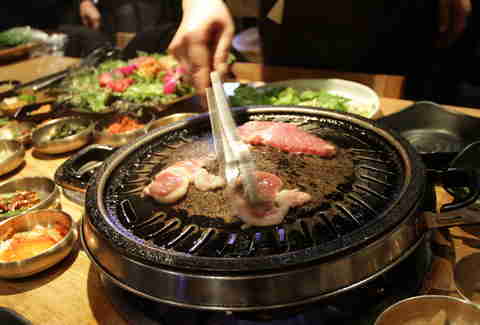 I've yet to meet someone who doesn't like Korean barbecue. The diverse textures of the varied cuts of meat and spread of condiments, sauces, and side dishes can certainly appease the pickiest of eaters. Understandably, though, this rainbow of wraps, meats, and pickled things can be confusing to the inexperienced eater. 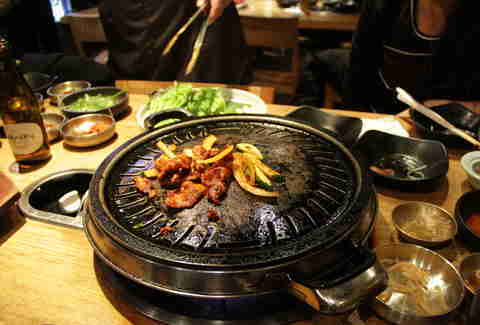 With the help of miss KOREA BBQ's KBBQ authority Seolbin Park, we've outlined the cuisine's cuts below. If questions like, "Is that a sauce or a side dish, and what part of a cow am I chewing on right now?” have kept you from incorporating KBBQ into your weekly dinner rotation, then read on and put down the meatloaf. 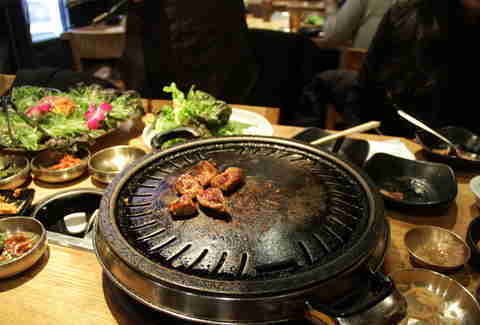 And once you've done that, read up on the dos and don'ts of eating KBBQ. You'll be a pro in no time. 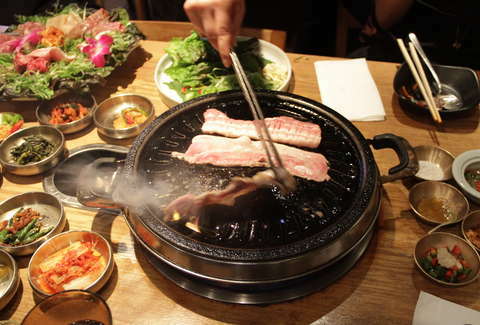 Though Korean BBQ is most closely associated with marinated cuts -- like the barbecued short ribs (kalbi) or marinated beef (bulgogi) -- the unmarinated varieties are just as frequently ordered. The prime rib isn't too different from backyard barbecue steaks, except that instead of A.1. 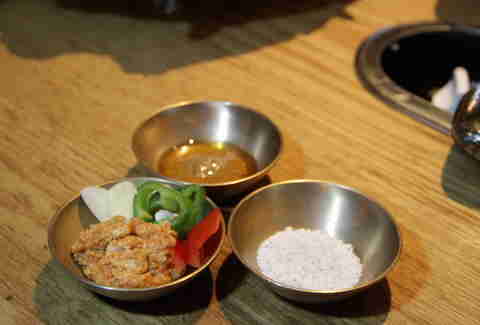 sauce, KBBQers dunk their bites in a salt-and-sesame oil mix. Top this cut with scallion salad and soybean paste (doenjang) for a salty, savory dressing. Sam gyeob sal, which translates to "three layers of flesh," is probably what most native eaters think of when they hear "Korean BBQ." It’s more succulent than bacon, and just salty enough to allow you to consume absurd quantities of it (because that's what you'll do) without rubbing the roof of your mouth raw. As for serving suggestions, it’s all about balancing out the grease. "Pork belly can taste a little too fatty, so you pair it with kimchi," says Park. "You could dip it in sesame oil, but that’s likely not the best option because it would make the whole thing too oily. Add ssamjang, a slice of garlic, and some scallion salad. Then eat the lettuce in 'one shot.'" Korean cuisine is surprisingly decent for the health-conscious, and the insistence on nutritional balance is a common culinary trend you'll notice across all Korean cooking. 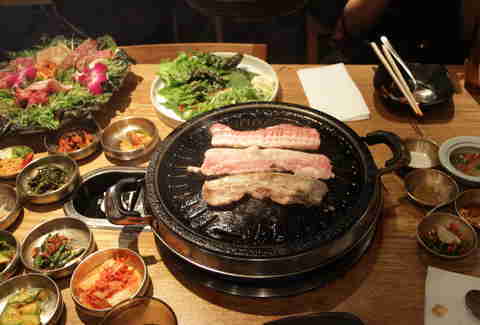 As Park says, "You always want to balance the meat with veggies." Perhaps the blandest cut in the entire KBBQ oeuvre, grilled duck absolutely needs to be topped with a variety of condiments to enhance the flavor, or else it will kind of just taste like chicken. "The texture and flavor of a marinated perilla leaf goes perfectly with unseasoned duck," advises Park. 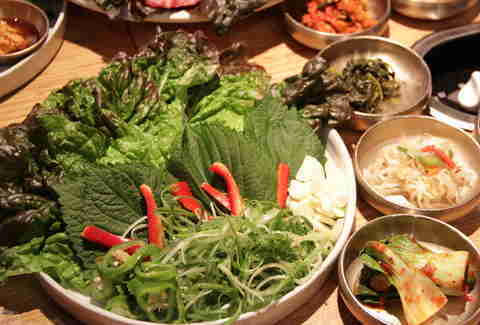 Often intensely spicy and bitter, these leaves can be a bit of an acquired taste for non-native diners, but are a must-have for more experienced folk. "This cut will give your jaw a workout and prove your manliness," says Park. But it will also be a juicy, greasy burst of flavor. Swipe it in soybean paste (doenjang) to bring out the savory, or just have the hunky thing by itself. Uptight Americans Could Learn Something From Koreans. About Poop. Chicken is not the most popular protein on Korean dinner tables, and that's probably why you’ll hardly ever find it not marinated. "You don't need a lot of condiments with seasoned chicken because the meat already combines so many flavors." Still, a slice of green chili pepper on your romaine leaf might add a refreshing crunch. I won't lie; any greens you add at a KBBQ joint are like tomato slices on a cheeseburger -- technically "healthy," but mostly there for texture. 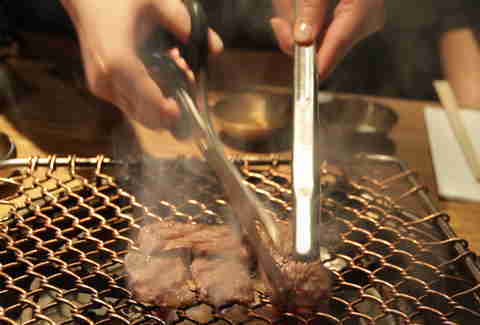 Kalbi, or barbecued beef short rib, is a Korean BBQ restaurant's staple -- the spaghetti and meatballs or chicken tikka masala, so to speak -- and you’ll find that each restaurant has a slightly different marinade recipe. 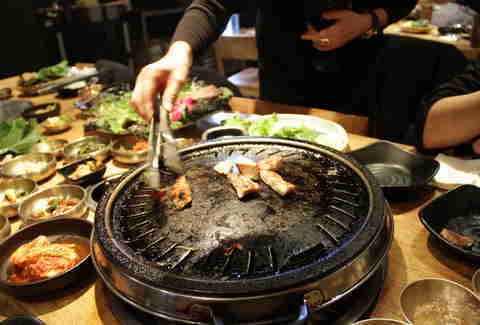 The kalbi served at miss KOREA BBQ is "top secret," but Park did disclose that it contains, as all kalbi marinades do, a mix of "soy sauce, garlic, and meat-tendering fruits." Served sweet and tender, kalbi is best enjoyed by itself, with rice (which actually serves as just a side dish at most KBBQ tables), or cold buckwheat noodles (naengmyun). 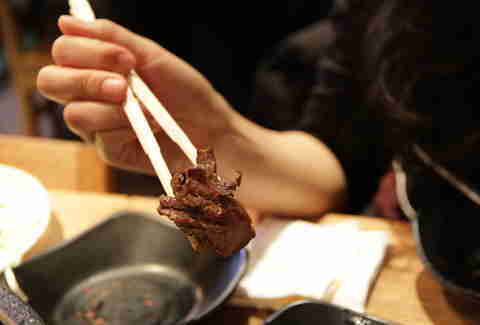 Another classic dish, bulgogi, or "fire meat," is predominantly sweet and chewy, and best had in copious amounts. It's the kind of barbecued meat that you have with scallion salad -- or any other cold, crunchy, green side dish, really -- so you can take your mind off the abundant grease about to line your stomach, and focus on the delicious pork gracing your taste buds. The meat is the meal's primary flavor source, but half the fun is enhancing the main component with different combinations of sesame oil, umami-packed soybean paste, raw garlic, jalapeño slices, scallion salad, and sprinklings of salt. If there's one thing that most differentiates Korean BBQ from its American brethren, it's that KBBQ is best enjoyed wrapped, rather than on its own. Crunchy leaves of romaine lettuce are standard, but your restaurant might even offer bitter perilla leaves (raw or spicy and marinated), or paper-thin squares of rice rolls. Use any of these to 1) contain your meats and sauces in a single, tidy entity and 2) pack as much meat into your body in a two-hour period as you can. Michelle No is a production assistant at Thrillist and doenjang makes everything better. Follow her on Twitter at @Michelle_No and Instagram at @MichelleNope.